They will suit the 308 & 30-06 cases, 7mmRM, Wsm, etc & magnums up to the Rums. The threads will be 1/2 x 28, 9/6 x 24 & 14 x 1 at this stage, to suit Tikkas, SPSS & other thinner barrels, etc. The final pricing hasn't been confirmed yet, but will be slightly cheaper than their big brother the T3. I will post some pics up with brakes I have tested them against. 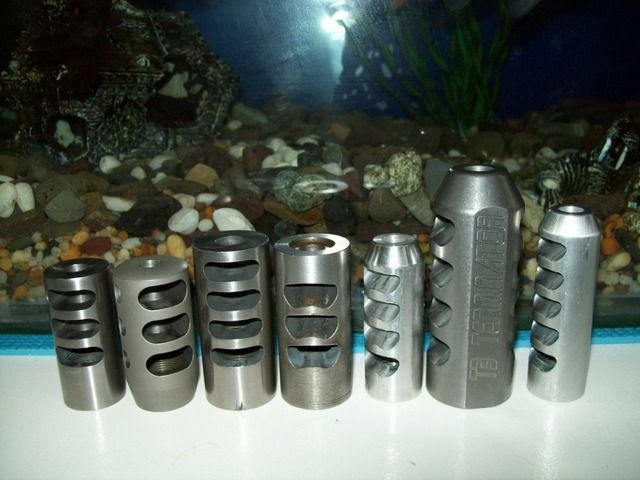 Here is a picture including the prototype T2, it is in Alloy, production ones will be in SS, with T2 Terminator on them. It is on the far right next to the T3. This is how the brakes faired in my testing using Factory 154 Hornady 7mm RM ammo. Left to right is least to most recoil reduction. Once I have some production ones I will post pics up of them. At this stage I will only be making the 5 port as it worked better than the 4 port. I don't have one fitted yet, will have after the weekend. I was sorting the flats for a spanner & phasing, as well as the engraving on them this arvo. what was the price on these greg? was lost in the server fart. also very uninformed when it comes to threading, will the stated threads mean the brake will sit properly level? veitnamcam, Toby and BRADS like this. Good video that. Perfect for 7 mm rem mag and upwards by the look of it. Hey Greg, had a go with a .300 Dakota with one of your T2 brakes on it, very impressed, I think my .223 has more recoil! It wasn't very pleasant to shoot next to however! Do you have a suppressor for that rifle you could also test?